Pope Tawadros II noted the word patriarch has three meanings; the first is fatherhood, as the patriarch is a father who carries the feelings of fatherhood which stem from the work of the Holy Spirit towards each one, adding humans need this feeling of fatherhood every day. “The second meaning is love, which is the main need of humans,” Pope Tawadros II continued. He acknowledged the world is currently hungry for the true love God planted in their lives to present to everyone. The third meaning, Pope Tawadros II remarked, is service, adding the priority for the patriarch is to be a servant but that service means humans should serve everyone. The Coptic patriarch added that washing the feet is one of the traditions established in the monasteries to express humility. He said their service comes from a heart of love and fatherhood to meet the needs of everyone, including marginalized people, tired people, the old and young. Service, he stressed, is the work of the patriarch. These are good words. The new Coptic Catholic Pope is named Ibrahim Isaac. He replaces Antonious Naguib, who retired for health reasons, but is currently in the Vatican enclave due to his status as a cardinal. The article is not clear about all that took place during the ceremony, but Pope Tawadros’ words could have been even more powerful if accompanied by the symbol he mentioned. Imagine if he had stooped to wash the feet of the new Coptic Catholic Pope. The Coptic Orthodox Church represents the overwhelming majority of Egyptian Christians. Interdenominational relations have ebbed and flowed over the years with Catholic and Protestants, but Pope Tawadros appears intent on fostering unity. As mentioned previously, he has helped facilitate the Egyptian Council of Churches. Each denomination will have equal weight and rotational leadership. It is a humble concession on the part of the Orthodox. During his speech at the inauguration, Pope Isaac remarked that the Holy Bible teaches us authority is there to serve, taking after Christ and his teachings. It is a common practice in the Coptic Orthodox Church for the leadership to wash the feet of the people, in a special ceremony once (perhaps more?) a year. Perhaps the Coptic Catholics do similarly, I don’t know. 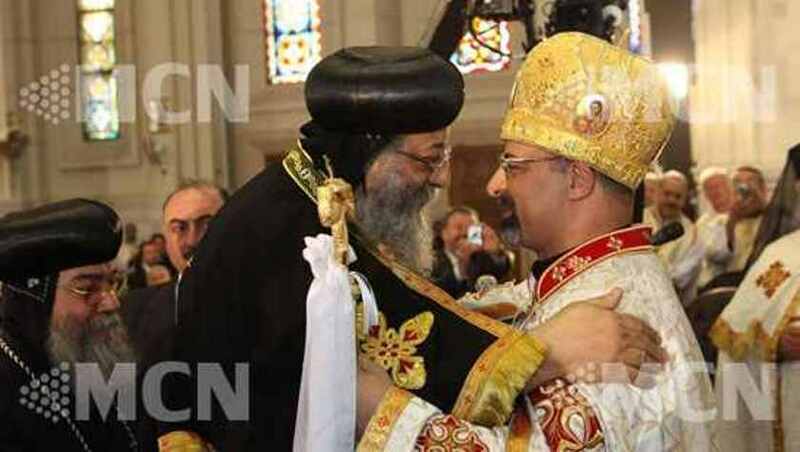 But on this occasion, if only Pope Tawadros had washed the feet of his counterpart – equal in ecclesiastic authority but so much less influential in Egypt. This is no criticism, only imagination. But to demonstrate this teaching on such an occasion would have been noteworthy. In Christianity, the greater serves the less. Even just in writing that sentence the protest issues: Shouldn’t Christianity make all people equal? Yes, and it does. But the world does not. Therefore, those who are invested with authority and privilege of position must do all they can to demonstrate their humility. They must overturn the way of the world, however rife with hypocrisy the statement may be, if they are not careful. Washing the feet can easily become the new pride. It is proved otherwise away from the cameras, in demonstrated service away from the eyes of the world. If only to continue imagining, might also the Grand Sheikh of the Azhar wash the feet of Pope Tawadros? Here, we are crossing religions which maintain their own traditions. It is not a proper comparison. But the Sheikh of the Azhar has consented to a similar humble concession. He has helped facilitate the Family House, in which he and the heads of all Christian denominations meet regularly to maintain good relations and solve sectarian conflicts. Muslims represent the overwhelming majority of Egyptians, yet the Grand Sheikh is outnumbered. In the world, everyone knows where power lies. This reality will not change because of humble participation in councils, nor in symbolic gestures like foot washing. People in power also have it in their interest to appear humble, which actually increases their effectiveness. Egypt’s spiritual leadership, Muslim and Orthodox, appear to heed this pattern. God only knows, but may he similarly equip Pope Ibrahim Isaac, and make him a shepherd to his people.